[0:41] "In 1996 Ross Perot was running for president. Three-quarters of the American people wanted to see him and I thought it would be fascinating to see him debating again. And when he was shut out, I was astonished and I thought, who is doing this? What entity is making this happen?" Since that 1996 disappointment, Farah has become a lightening rod in the presidential debate world. His organization, Open Debates, relentlessly pushes for changes, like adding more debates, reducing involvement from political parties, a lower bar for candidates to get into the debates, and a broader variety of formats including more candidate interaction and panels of experts asking questions. This year, his criticism has been particularly sharp on a subject in the headlines, something called the "Memo of Understanding", a secret document negotiated by the political campaigns that lays out debate parameters. This year's 21-page Memo of Understanding caused a 24-hour firestorm when it was leaked to Time's Mark Halperin prior to last week's town hall debate. It indicated the debate moderator would not be allowed to ask follow-up questions. But the Commission on Presidential Debates insists that it's not a party to that document and while candidates may agree between themselves to certain rules, like not asking each other questions, the Commission is not governed by that deal. A source close to planning for the debate last week confirmed to CNN that moderator Candy Crowley never saw the campaigns' Memo of Understanding and that the Commission never asked her to hold back on follow-up questions. Commission leaders insist they have not signed off on any such memo between the candidates since at least 2000. [3:25] "The [Bush and Gore campaigns] said if you don’t sign this and you don’t get the moderators to sign this, we’ll go elsewhere. And we said, fine, go elsewhere. We’re not signing it." Editor's Note: Criticisms of the Commission do not end there. Listen to the complete story above for a look at other issues in the presidential debate system and how the Commission on Presidential Debates responds, and then join the conversation below. Well, it sure would be nice if this type of thing aired on CNN TV. There is a lot of truth on the internet that seems to never make it to "primetime news." The CPD violates it's own mission statement to "provide the best possible information to viewers and listeners" . It is the perfection of corruption of our democracy . This is all true. It's disgusting. They think we're all stupid, and in some ways they are right. We've allowed them to exist, control our information, and drive who we see in the debates. FCC Rule 315 should have covered us and it does not, because Congress, Republicans and Democrats, allowed them ridiculous outs. Do everyone a favor, hire the best qualifications, a two-term governor, and a Veteran, Peace Corps Volunteer, and Judge. Don't buy in to this. The "debates" are hosted by third parties–no longer by the major networks. Reason? Equal air time for all candidates–including third party candidates. However, network television gets around that technicality with a major loophole: if someone ELSE hosts the debates, then it becomes a "media event," a.k.a. "news." No third party will ever be allowed into the presidential debates–only parties who've won in the past get to participate. So, guess it's time to dust off the Whig Party and a few other mothballed parties to get someone on stage besides "Republican" or "Democrat." Hey KlintzCNN, actually the reason the Commission on Presidential Debates stepped in is b/c there was a vacuum. The League of Women voters hosted the debates previously (1976-1984) but refused to host any more in 1988 after the George H. W. Bush and Dukakis campaigns dictated so many demands that the League felt (and wrote in a press release) that the debate would have been a fraud upon American voters. 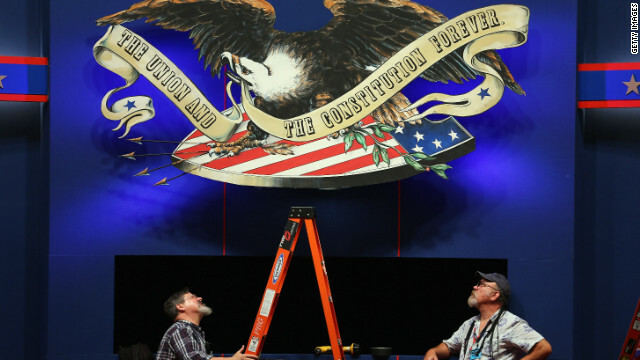 There were two independent commissions to come up with a solution and the one that ended up winning out decided that the two political party leaders (heads of the RNC and DNC) should head a new debate commission. The RNC chairman at the time, Frank Fahrenkopf, still heads the debate commission. Mike McCurry of the Clinton admin. is his Democratic counterpart and co-chair of the debate commission. So, from that view, it was run by the political parties. Though Fahrenkopf and his Democratic co-chairs have insisted that they take off their political hats when talking debate. This is one reason the commission sparks fiery response. The way I see it is the only good thing out of htis years political process is all the cash put into our eceonomy by the polical parties and supporters. Just as religion and government are seperate, there should be more seperation between business and government. Depends on how you look at it. Sure, they're pumping tons of cash into political advertising and other campaign venues, but this very factor leads to biased coverage by stations which perpetuates the party duopoly the Republicrats have enjoyed for forever. The very institution of the CPD is a red flag that the left and right are both afraid of change-they know it would be positive for our country, but not for their own self interests. The unfortunate truth is that Americans as a whole are ignorant to political matters, and choose to be so. I can't tell you the number of people that just "don't vote" or vote for someone "because they're a Republican/Democrat" or because they're the "lesser of two evils". The only wasted vote is one for a candidate that doesn't have the interests of the country at heart, which is both the current candidates. Third parties are the only way we'll show the government that we the people dictate their behavior, and not the other way around. ….no Einstein…America went from a 13 colony misfit mob to a world super power using EXACTLY THAT MODEL. Don’t even try that garbage on people who ACTUALLY KNOW our history…..and along those lines, are you going to even remotely suggest 1775-1945 was a SOCIALIST MODEL ???? Get real. so all the money government invested in business had nothing to do with the development of our industries? or the fact that wwII left a huge gap in the auto industry from bombing plants had nothing to do with our auto industry booming? it was all small government? and everyone who doesnt think that doesnt know history? The problem is there has to be a medium between the right and the left. Moderates are unpopular with their parties and don't typically see nominations, which is unfortunate. More government definitely isn't the answer, but we can't allow corporations to run their own game, or we see massive levels of corruption. Government exists to serve its people, not to dictate them. … CAMP 1 believes food, clothing, housing, education, and health care are RIGHTS…and even though half the nation disagrees with them, they still believe the OTHER half should pay for THEIR entitlements. They believe a GDP of $2.1T and BUDGET of $3.8T is “o.k.”…and the realities of Europe and economic laws DON’T MATTER. ... CAMP 2 believes those things are NOT rights…in ANY constitution, nor in ANY nation on the planet…for a REASON…never were…never will be. If they were nothing would get done and everyone would just sit around waiting for others to pay for their entitlements. They believe $2.1T – $3.8T is imminent failure based on first grade math, logic, economic laws, Europe, and 4600 years of repeated history. They KNOW it is just a matter of time before REALITY and MATH catches up…and the “free stuff” mentality WILL come to an end. They KNOW we have to face those realities NOW…not defer them to our kids (and our kids’ kids) just so we can add 30 million MORE people to the “FREE STUFF” list. Sooner or later reality WILL catch up….and the “free stuff” Socialism movement WILL run out of OTHER people’s money to dole out. Defer economic laws all you like…sooner or later your entitlements WILL run out of money. “TAX THE RICH…THAT WILL FIX THE PROBLEM”….no Einstein…we now MAKE $2.1T and SPEND $3.8T. per Obama’s “plan” directly, that adds $80B per year in added revenues, ergo those #’s go to MAKE $2.18T and SPEND $3.8T…. (PROBLEM FIXED !.....oh….wait…no). So that will run your suggested “plan” for EXACTLY 9 DAYS. Congrats. My question to you is…”THEN WHAT?....WHO DO YOU BLAME AND GO AFTER NEXT?...WHO WILL BE THE NEXT TARGET IN OUR SPRINT FOR SOCIALISM?” I swear we deserve to lose the spirit which lifted us from a 13 colony misfit mob to a world super power…and we will lose it to the ENTITLEMENT and FREE STUFF mentality which has engulfed this population and turned us into a spineless, gutless, whining, watered down version of a SOCIALIST European state. (CNN) "Are you better off than you were four years ago?" 9.4 million - Number of people unemployed in August 2008. 12.6 million - Number of people unemployed in August 2012. 6.1% – U.S. unemployment rate in August 2008. 8.1% – U.S. unemployment rate in August 2012..
1.6 million - Number of long-term unemployed (jobless for 27 weeks or more) as of August 2008. 5 million - Number of long-term unemployed (jobless for 27 weeks or more) as of August 2012. 5.7 million - Number of people working part-time, involuntarily, in August 2008. 8 million - Number of people working part-time, involuntarily, in August 2012. $3.96 - Average price for a gallon of milk in July 2008. $3.92 - Average price for a gallon of milk in September 2012. $4.09 – Average price for a gallon of unleaded gas in July 2008. $4.11 - Average price for a gallon of unleaded gas in September 2012. 68.1% - U.S. homeownership rate as of June 2008. 65.5% - U.S. homeownership rate as of June 2012. $196,600 - Median price of an existing single family home in 2008. And the right had NOTHING to do with the continuous downward slide of our economy since Bush, right? Both parties are to blame. Hoisting all the responsibility on a single person is both irresponsible and dishonest. The two parties are both crap and we need to allow more than only two trains of thought to dictate American politics. Freedom of choice doesn't mean freedom of a choice of two piles of crap. “DEBATING HEALTH CARE, SOCIAL SECURITY, AND MEDICARE”… what part of “UNFUNDED LIABILITY” do people NOT UNDERSTAND !? The ENTIRE PROGRAM along with SOCIAL SECURITY becomes INSOLVENT after 2022 ! We are already GIVING OUT MORE THAN WHAT IS TAKEN IN…. That is directly from  treasury.gov  bls.gov and  your very own Geithner and Bernanke testifying before the Senate Budget Committee FEB 2012 (both of them stating “UNSUSTAINABLE”) . Arguing this is tantamount to arguing over ARRANGING THE DECK CHAIRS ON THE TITANIC for pete sake. Instead of choosing NOT to hand our kids OUR garbage...we are more worried about OUR OWN SELFISH SHORT TERM ISSUES !!!???? We are a sick bunch of entitlement junkies...who apparently cannot even function without a dependency umbilical cord attached to D.C. What happened to us? Cut spending and raise taxes! lets see...do I choose a Socialist, Marxist, Anti-Entrepreneur who only knows how to re-distribute (by force) from one to another (all in the name of "fairness" of course....even though HALF THE NATION disagrees with him)......OR.....do I choose someone who at least UNDERSTANDS the period form 1775 to 1945 was NOT a Socialism model...and is EXACTLY the model Liberals claim "doesn't work" (yet they have NO explanation as to what model we DID use to rise to a world super power). hmmmmm....decisions decisions. but we ARE social democracy and have been for quite some time. you use those words often but i do not think you realize what they mean and how far america is from those in a pure sense. Yeah, let's get the guy in that has a history of making money by laying off workers, closing companies, lying through his teeth and swapping positions three times on every major political issue. Good idea. Don't get me wrong, Obama's also crap. But there aren't only two names on the ballot. The Obama administration is a classic “CULT OF PERSONALITY”…. he looks good, promises free stuff (at the expense of OTHERS’ MONEY AND FREEDOMS…all in the name of “fairness” of course) even though HALF the nation disagrees with him. He demonizes (vilifies) the very principles, means, and group that ENGINEERED and EXECUTED the rise of America (1775-1945)….using a smaller govt.+free market model (you know….that model Liberals say “doesn’t work”?...yes, THAT model ). The media acts like a mob of 14 year old girls at a Justin Bieber concert. Debates NOW are judged by volume, energy, and childish two year old kindergarten smirks & gestures….rather than (god forbid) PERFORMANCE RECORDS and REPORT CARDS. Never before have I ever witnessed SO MUCH use of DIVISIVE tactics with regard to class, race, and religious warfare….nor have I EVER seen a President take ZERO responsibility for the last 4 years. Pathetic. “5 THINGS TO LOOK FOR IN THE DEBATES”  blame someone else…take no responsibility for the report card of the last 4 years. demonize evil biz owners…. small biz entrepreneuers (>$250k entities)..even though they EMPLOY and CARRY 85% of the tax revenue WEIGHT. promise free stuff …even though we cannot pay for it…and at the expense of HALF the nation that DISAGREES WITH THEM….all in the name of “fairness” of course  push Socialism over American ingenuity and entrepreneurial pioneering (you know…the SMALL GOVT + FREE MARKETS model that Liberals claim “doesn’t work”…but they cannot account for WHAT MODEL was used between 1775 – 1945…you know, THAT model…the one where America launched to a world super power?....THAT one.) use immature, kindergarten, childish smirks and gestures to distract away from the report card of the last 4 years. ***I GUARNATEE YOU EVERY LIBERAL RESPONSE WILL FIT INTO ONE OF THOSE FIVE CATEGORIES. The debate commission has become nothing more than a shield for the media companies. They ensure that no minor party candidates will be able to compete in the debates. I agree with audio only debates. I also think the moderator should call out a candidate if they're not answering the question and just spewing campaign rhetoric. Something like this: Sir, if you're not going to answer the question please let me know so we can move on. Take charge of the debate. Let a third party in again too. If not than end them because they're just a distraction for people looking for real answers. I wrote about this in a tweet, but completely agree that an audio-only debate would be interesting. You listen differently when it's audio only. And for those who are ADD sports fans, it would make for an easier simulcast with baseball or football tonight. 4 debates, all on the east coast. All questions screened and leaked to campaigns beforehand. No third voice allowed. Billions spent to buy the presidency... is this really what our founding fathers invisioned? Wow. When did Colorado become part of the East Coast? There is no reason that every person on the ballot shouldn't be in the debates. I think more people would look to a 3rd party candidate if they could participate. I know I would. Hey ghostriter and others – you probably heard in the story but the group "Open Debates" is calling for a poll that lists all the candidates who are on the ballot in enough states to get 270 electoral votes and asks who Americans would like to see debate. I'm assuming you could pick more than one answer. It's a really interesting idea. I agree with the contention that ALL candidates, for ALL political parties, should be included in the debates. The 2 main parties have been shutting out, any chance, others have of being HEARD, for decades. That is totally unfair, and totally foreign to the principles of this country. I also think that the Media people who have being the moderators of these debates, can no longer be entrusted to run these debates fairly, and impartially. The partisan bias, in the media has become RAMPANT! If we are to have, a truly free, democratic society, we must provide a level playing field for all candidates, to receive equal treatment, and opportunity to be heard. It is time for the sponsor of the Presidential Debates, to open the debates up, and make them inclusive, to be meaningful. It is also the responsibility of the media, to do the same, with the primary debates, and provide all candidates in the parties, an opportunity to participate. That HAS NOT been the case. There is much to correct, in our political process, and we can expect a high level of resistance from both major parties. Do all you guys asking for all candidate to appear really want a 6 hour debate? In order to give each person a reasonable amount of time to respond to the questions, that is what each would take. Granted, those who are interested would pay attention, but they would generally be the same people who can easily sit and watch wallpaper dry. Even though Ross Perot carried a number of votes in 1992 and 1996, the last time a third-party candidate carried any electoral votes was George Wallace in 1968. Before that it was Teddy Roosevelt's Bull Moose/Progressive party in 1912. Prior to that, the previous 3rd party with electoral votes was the Republican Party in 1856! So 3rd Party Candidates with enough support to carry at least one state are the exception rather than the rule. There is a very substantial effort going on to continually achieve very significant and unreasonable financial gains for the few, and those who have actually been emotionally drawn in will find it difficult to accept they are being used. The subterfuge is compelling and, as intended, the propaganda excites with its hype and compels with its emotion. Many of those defending and supporting the effort really don’t understand that they are being used for the self-serving interests of a few. The way it becomes clear is when stepping back, clearing the mind, calming emotions and rationally considering what is obvious in the deception, in who benefits and in the reality of what it actually costs the majority. What can make it apparent is to simply look at the total picture and in that overview see what is being accomplished that is almost beyond comprehension. Today many people’s beliefs, emotions, loyalties, biases and prejudices are literally being exploited for the benefit of the very few. An article, Widening Gap Between Rich and Poor May Slow Growth for All, by Annie Lowry, The New York Times, points out the result recognized as the dynamically increasing financial gap between the very rich and everyone else. Ms. Lowry explains that the problem grows as the 1% take, in todays recovering economy, 93% of the growth and that the problem is perpetuated as the inequity breeds further decline, which then breeds further inequity and then that political success just becomes a symbiotic dependent, with politicians, even political parties, selling themselves to the cause. We have seen all of that, especially over the last twelve years, with the Republicans catering to the very wealthy who continually gain while the majority are neglected. What needs to be understood is that this is totally intentional and efforts like the manipulation of the “conservative” Christian, the Swift-boat propaganda, the Tea Party movement and so much more are all designed to achieve these ends, without concern for other than the financial gains of the few. The spending, the propaganda, the “puppet” politicians, the conning of the clergy, individual groups and voters in general all have the one goal in mind – to move the country further into being a two-class society with the 1% feeding their insatiable “more” (never enough) appetite, while the 99% necessarily constantly loose. The Republican / Tea Party and their strong supporters, with the likes of Norquist, Cheney, Rove, the Koch brothers and many more, have boldly displayed these efforts and really leave absolutely no room for the majority to expect anything or to have any valid reason to identify with them. Whenever we put aside our biases, prejudices, loyalties, fears and emotions so they can’t be used to con and manipulate us, all of it is completely obvious, disappointingly so to many but none the less totally apparent. Today it is literally a totally progressed cancer and the only way to regain health is to cut it out. The country would be far better off with money out of politics but that isn’t to be as even the Supreme Court has contributed to the problem. What the voters can do is to make “the money’s” power, influence and mega-millions ineffective by completely rejecting their manipulative propaganda and firmly rejecting their “puppet” politicians. The people really need to see that there is no hope in supporting the “puppets” of those few who want it all and who propagandize the country to sell their self-serving objectives and instead to pressure the Republicans to once more focus on the people and again become the Grande Ole Party. Otherwise we could just be returned to “more of the same” which necessarily will simply result in “more of the same”. Common Sense in considering the “puppet” politicians being offered: If they continually lie without even a hint of a conscience, how can you trust them? If they constantly demonstrate they don’t care about anything more then their political ambitions, how can you have any confidence in them? If they have nothing to offer but criticism and propaganda, how can you expect anything positive from them? If they are totally dependent on the 1%, dependent on “the money” who support and control them, how can you look for them to perform for the 99%? If the last twelve years clearly show all of these things and yet they still are arrogantly cocky confident, how can you be other than insulted as they just take the people for granted? If their offerings and propaganda are aimed to achieve only their purposes, how can you ignore they are obviously not right for the job? Clearly brevity isn't your strong suit so let me summarize your dissertation up for you. You think Republicans are evil and that they are controlled by money. You think extremely wealthy people only contribute to the Republican party in an effort to keep their money and keep the poor in their place. The problem with your argument, aside from the fact that it is redundant and rambles on far too long, is that Obama has actually out-raised and out-spent Mitt Romney. He is also funded by extremely wealthy people like Warren Buffet and George Soros, wealthy corporations like Google and Goldman Sachs. Many in the entertainment industry, individuals who not only enjoy extreme wealth but unparalleled privilege and entitlement, also support Obama. By glossing over those facts and focusing entirely on the Republican Party, you are clearly not arguing for the reform of a corrupt system. What you seem to want is for everyone to only choose the party you support. So really, all you needed to do was say two words "Vote Democrat". The rest of your post was just fluff. Badly written, pretentious fluff. His only real problem is to think that only one side is bought and paid for. However, republicans are the only ones campaigning on it. And they aren't being too clever about it. You see, republicans are the ones complaining that the "job producers" need more cash. More than the $2 trillion they have been sitting on. To what end? They are pushing a failed trickle down theory that doesn't take into account that demand is a better driver of job creation than available cash. At the same time, they are pointing to the middle and lower classes as the roots of our issues. Entitlements, making up a rather small portion of our budget, is made out to be the bane of our existence. Planned Parenthood and Big Bird are offered up as sacrificial cuts to gods of the balanced budget. Yet, the military is out of bounds. That, in of itself, makes little sense. The bottom line is that republicans are for the "job producers" for better or worse. To try and go against that is folly. The only argument is whether their approach works or not. It's funny you should mention trickle down theory. I agree, it doesn't work all that well to improve the plight of those living below the poverty line. Obama has offered an alternative which does improve the plight of those living below the poverty line, for now. I agree that Obama's policies have created jobs. Unfortunately the bulk of the jobs created by Obama, according to CNN, have been in Government Sector and low paying, unskilled labor. Both of those are actually a deficit creators because the one drains the government's resources and the other doesn't contribute to them in any meaningful way. The result is Obama can boast that he created jobs in order to get re-elected and people will look at the jobless rate and give him credit. But he is leaving the extremely hard choices for the next president. By then the deficit will be so enormous we will find ourselves having to make the same choices as Greece. That is one reason I am supporting Romney. For the fixes to the economy, Romney has a razor thin advantage. Nice read. Problem is that most folks don't realize what's going on around them. It's easy to say that there is a wealth gap that is growing. But what is the cause? Conservatives say the govt is squeezing the life out of the "job producers" (read: the rich). Liberals say the producers aren't paying enough. So who do you believe? Capitalism, in the form now practiced, is the problem. Simply put, employees are now seen as an unwanted expense to be cut to the bare minimum. We will fire experienced workers who command higher salaries for those with less experience and pay. Over the past 20 years, we've seen employee production rise, especially in recent years with recessions making the demand for jobs higher than the supply. Meaning employers can find excellent talent and pay them less. We've also seen no noticeable rise in salaries. They have hardly kept up with inflation. The average household salary now is $50,000. How ridiculous is that? What we've also seen is a rise in corporate profits and CEO compensation. Companies have reported record breaking profits the past decade or so. And CEO's are making 20 times as much as the median salary in their companies. Yep, the same CEO's that can layoff 200 people and collect a nice bonus check that would have paid for those 200 people to keep their jobs. Afghanistan than we did under Bush ... More US soldiers have been killed in Afghanistan under Obama than under Bush ... Please tell me how Obama is protecting our troops, and explain how it is that Mr. Obama ... is such a failure in Afghanistan. If the President had pulled the troops out of Afghanistan, would you be congratulating him? Two problems with the debates this year: Jim Lehrer and Candy Crowley. Barbara Raddatz did great. Too bad it was just a VP debate. The format for each debate has been different by design of the moderator. Jim Lehrer wanted a free flowing argument between the candidates. Therefore, he provided little restraint against the candidates. Martha Raddatz sought answers to her questions. Therefore, she utilized follow-up questions when responses were lacking. Candy Crowley sought to get as many questions from the audience answered. Therefore, she tried to keep the debate moving, which required sharp rebukes and corrections against the candidates at certain times. However, probably the most significant feature of the three debates was the fact that the Vice Presidential candidate were seated next to each other and directly in front of Ms Raddatz, which afforded her greater control by proximity to the candidates. For me personally, the problems with debates are twofold. First, they've become so "scripted" that they're basically extensions of the advertising/marketing campaigns that the candidates are running. The candidates never seem to directly answer the questions posed to them, but instead fall back on the same old tired slogans of commercials and campaign events. Second, in this era of "American Idol" and "Dancing with the Stars," the focus of debates seems to be on instantly declaring who won–and making that judgment exclusively on zingers, facial expressions, body language, cut-of-the-suit-and-color-of-the-tie, and other style points. I know CNN (and the other TV networks) won't like this idea, but let's have some audio-only debates where voters can perhaps focus on what's said, instead of how it is said. A very cogent assessment. The structure of the debates is one of a long list of things that are wrong with presidential campaigns. Some others inlude: the anti-democratic Electoral College system, the primary system, length of the campaign, vast amount of spending on ads, corruption facilitated by Citizens United ruling, anonymous donors and zero spending limits. We have a huge mess, and it only gets worse with time. It leads to worse candidates, more corruption, endless lying and truth-evasion, and voter fatigue/apathy. Like our health care system, we may also have the worst presidential election system in the industrialized world.